The overlap and fluid borders between design and art have inspired many discussions as to the essence and nature of design. As many designers work both as artists and designers for large commercial producers, this contributes to the blur in the external distinction for the world at large. This soft transgression from art to design sent Nordic Design News searching for the experience of the designers when crossing, combining and working in both spheres. The Finnish design duo, by TuominenPatel, by Terhi Tuominen and Jitan V. Patel, is an adept example of such a design business. In their own words, their explorations result in art pieces, conceptual objects and commercial products. “Its exciting to be part of the worlds of art and business! They feed each other. We feel, that it is important to keep our work fresh by working with both artisans and manufacturers and relating the commercial side of our work to business needs. We design a lot of bespoke furniture and objects in our interior projects. Our design as a business also varies. We have made creative tailor made solutions for homes with small spaces, and an inspiring seminar room for a law office with adjustable furniture solutions. Recently, we have designed a large dining table to fit 30 persons, allowing the entire company to gather for breakfast meetings. “Tuisku and Kinos, on the other hand, are unique art pieces available for purchase. 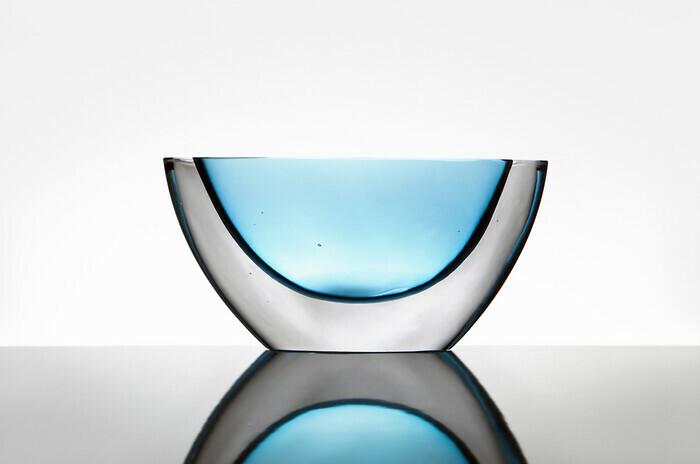 They are the outcome of our experimentations in free glass blowing and working with new materials. When we designed those, we were inspired by the shapes of snowdrifts in Finland. The snowdrifts that form from the harsh winds represent the exterior and form of the vases, and in contrast the interior of the vases have strong colours to indicate the heat within a snow cave. It seems to confirm the saying, that nothing exists without its opposite. Even though idea of the warm colours may definitely seem most inviting to many. Even Nordics. Terhi Tuominen and Jitan V. Patel are based in Helsinki, where they also run the design agency Dayground. They are currently part of Venice Design 2016 with unique glass art exhibited at Palazzo Michiel, Venice, Italy, during the Venice Architecture Biennale, 28 May - 27 November 2016.